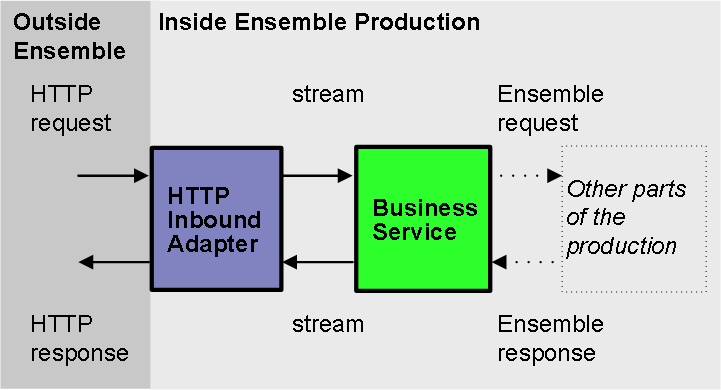 Ensemble also provides specialized business service classes that use these adapters, and one of those might be suitable for your needs. If so, no programming would be needed. See Connectivity Options in Introducing Ensemble. The EnsLib.HTTP.InboundAdapter is the Ensemble HTTP listener for custom port listening, XML listening, and/or raw HTML handling. You use this adapter in cases when you prefer to listen on a private port rather than using a CSP page (which uses the standard web server to handle HTTP requests). When you work with the HTTP inbound adapter, there are two helper classes that you might use: %Library.GlobalCharacterStream and %Library.GlobalBinaryStream. The inbound adapter sends a stream to the associated business service. Specifically, this is an instance of %Library.GlobalCharacterStream or %Library.GlobalBinaryStream, depending on the character set being used. In general, these classes provide methods that you can use to read the contents of the stream, get the length of the stream, read a single line, rewind, append data, and so on. Both of these basic classes are documented in the Caché documentation; for example, see the chapter Working with Streams in Using Caché Objects.